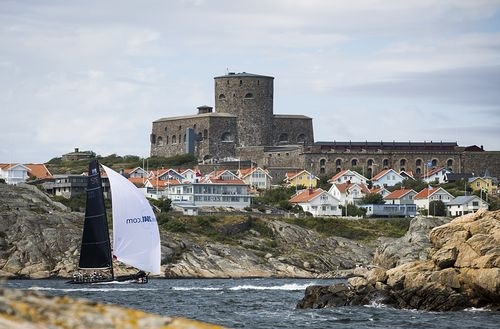 With one day of racing left at the RC44 Marstrand Cup on Sweden's west coast, the two Vladimirs' teams are vying for the lead. 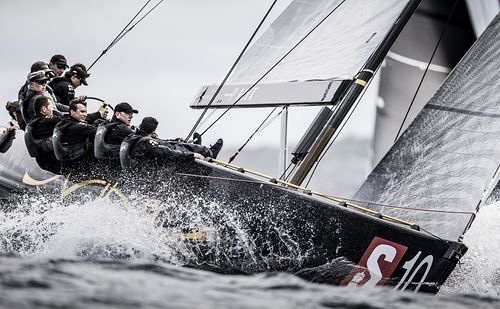 This morning Vladimir Liubomirov's Bronenosec Sailing Team was ahead by a point but an opening race win for Vladimir Prosikhin caused his Team Nika to regain first place. They held on to it until disaster struck towards the end of the last race, where Liubomirov recovered first. Currently Bronenosec leads Team Nika by four points and with three races scheduled tomorrow any of the top six boats could win. Coming ashore Prosikhin was feeling conflicting emotions. 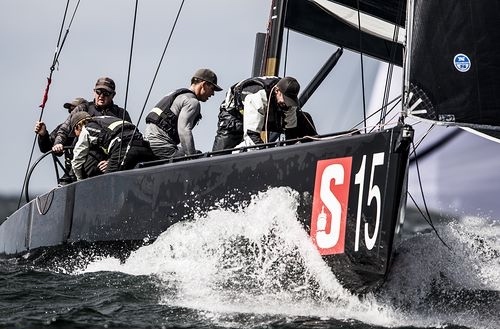 In the first race Team Nika just managed to sneak in on port tack at the weather mark as the competition bore down on her on starboard with rights, a move that had resulted in a penalty when Prosikhin had tried it yesterday. Today he was successful and Team Nika went on to take the win. After finishing fourth in today's second race, Team Nika set up for a podium finish in race three until the last run towards the finish line in the Marstrand Fjord, when a series of disasters hit. A genniker twist developed during a gybe and with a boat immediately to leeward Team Nika was unable to bear away to unwind it. Eventually they sorted it out, but Prosikhin then gybed in front of Peninsula Petroleum and bore away too early resulting in the two boats touching. "So we got an expensive downwind penalty, had to drop [the spinnaker] and we came into the harbour last. But we fought and gained two places back, which I am proud of," Prosikhin said. Charisma got her second bullet of the series in race two. This largely came about through a good fast start by the committee boat. "Straight away we were a length ahead of the fleet. From there it is a lot easier. We just tried to keep it really simple and let the boat do its job. 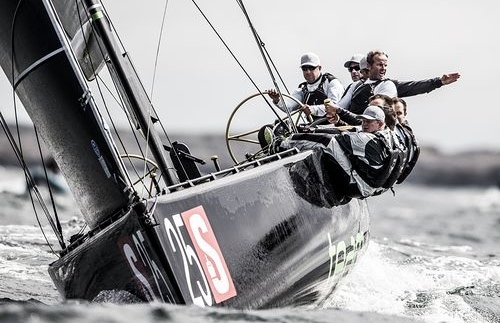 We sailed clean all the way around the track, but life's a lot easier when you are in front," said tactician Ray Davies. 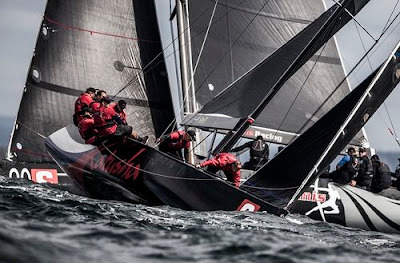 Like Team Nika, Charisma's final race was disappointing, finishing seventh after a broach on the second to last gybe as the westerly wind built to 20 knots. The last race today went to Chris Bake's Team Aqua with Swede Richard Goransson on the helm. "We did a good first beat and overtook Team Nika on the downwind. After the rounding, we managed to keep our distance and once we were ahead at the top mark we were pretty much fine, but it got scary at the end because the boats behind were all coming in with a lot of breeze whereas our breeze was dying," Goransson said. "We are learning every day, getting better by increments. Downwind we have been fine mostly, although we had a wipe-out in a gybe in the second race today. It is nice to see finally what it is like to be ahead," he added. 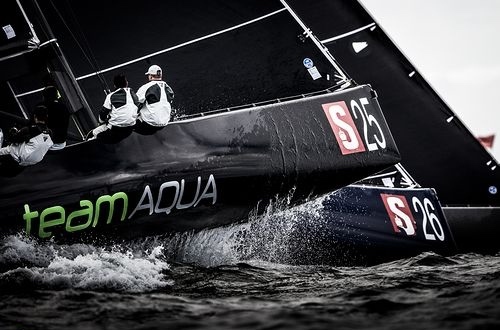 "The beats were hugely difficult - the breeze had gone right and on port you were across the waves and on starboard you were straight into them and then they kicked up really steep," said Aqua's tactician Cameron Appleton. "It was great fun - very nice weather, difficult conditions, lots of wind. We've been improving every day thanks to a great team and a great effort," said Russian RC44 newbie Alexander Novoselov on Katusha. With Andy Horton off on paternity leave, tactician this week is British America's Cup helmsman Chris Draper, sailing in his first ever RC44 regatta. "Everybody is super smart. If you bleed a few lengths, then you're history. As a whole, the standard is insanely high. 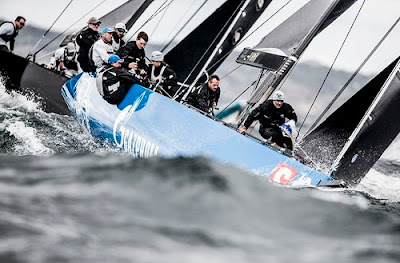 The guys at the front, drive the boats bloody well - anybody would struggle to beat them," Draper said. "Alex [Novoselov] is doing an awesome job downwind, he's a downwind machine. We're getting ourselves back in there. It was good in the last race, to put a start and a first beat together and keep it simple from there," he added.